Sixty maths statements to be investigated. Great to get children talking about Maths. 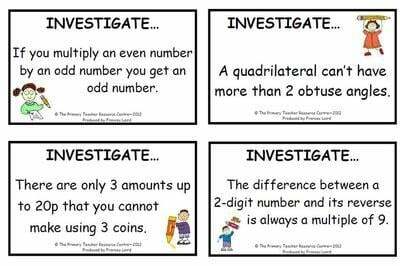 Our Maths Investigation pack contains sixty maths statements to be investigated and is great for the 'using and applying' area of maths and for evidencing on APP grids. Digits in the 9x table add to 9. Add any four even numbers. Now divide the total by 4. There is no remainder. A triangle is a regular 2D shape. Numbers in the 7x table can be found by adding the multiples of 3 and 4. 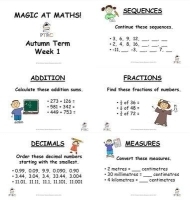 On each A4 sheet there are two maths statements and the pack also includes an A4 instruction page with possible extension activities. Ideally these cards would be printed and laminated meaning that they can be used over and over again. The investigations are aimed at children in years 5/6 but children in years 3 and 4 would be able to access many of the statements. Each card is decorated with a playful Clipart image thanks to our license with Clipart.com.